Prof Strumia told BBC News that he stood by his remarks. "Some people hated hearing about higher male variance: this idea comes from Darwin, like other offensive ideas that got observational support," he told BBC News. "Science is not about being offended when facts challenge ideas held as sacred". He added that he believed that he had not been fairly treated. "For months, Cern kept 'investigating' if my 30-minute talk might have violated Cern rules [requiring an] 'obligation to exercise reserve and tact in expressing personal opinions and communication to the public'," Prof Strumia said. "In such a case, they would have opened some procedure, where I would have been able [to defend] myself. This never happened." His analysis was quickly dismissed as being unscientific and incorrect by experts in the impact of research. But Profesor Strumia told BBC News that his analysis would eventually be proved correct if scientific journals would allow him to publish his research. "Extra checks confirmed that my results are correct and in line with the specialised literature. "This will be shown in a scientific paper, if it can appear". In a statement Cern said: “The incident was investigated in light of the internal Rules and Regulations and the Organisation’s Code of Conduct, which is based on Cern’s core values." Dr Jessica Wade, a physicist from Imperial College London who was at the workshop where Prof Strumia made his controversial remarks welcomed the decision. “The recent statement is a powerful message for scientists all over the world; irrespective of your status, you will be held accountable for your actions," she said. "Well-funded senior academics should not use their positions of power to attack colleagues or demean the work of women." What was Prof Strumia's argument - and why was it dismissed? 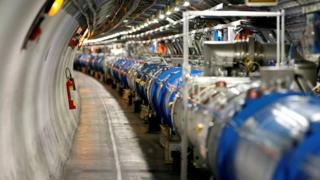 Prof Strumia analysed papers available in a database of particle physics research. He produced a series of graphs which, he claimed, showed that women were hired over men whose research was cited more by other scientists in their publications, which is an indication of higher quality. This evidence, he said indicated that men produced better research than women. But a group of physicists posted their take on the analysis at particlesforjustice.org and stated that they believed it to be "fundamentally unsound". They said the correlation was a reflection of the difficulties faced by women in research rather than their abilities. There are many more men in particle physics, and they tend to cite other male colleagues over women. Senior researchers, who are mostly men, often add their names to research conducted by their junior colleagues on the grounds that they supervised the work, although their contribution to the work can often be minimal or non-existent. And disproportionately higher rates of women leave the field. Those rebutting Prof Stumia's analysis said that "Prof Strumia is not an expert on these topics and is misusing his physics credentials to put himself forward as one. Those among us who are familiar with the relevant literature know that Strumia's conclusions are in stark disagreement with those of experts. "He frequently made the basic error of conflating correlation with causation, and while Strumia claimed to be proving that there is no discrimination against women, his arguments were rooted in a circumscribed, biased reading of the data available, to the point of promoting a perspective that is biased against women".